Size (Inch): 1" to 6"
- Blades made from Alloy Steel full Hardened. - Handle made from Rijan Seasoned Wood. An ice pick is a tool used to break up, pick at, or chip at ice. but is designed for picking at ice rather than wood. Before the invention of modernrefrigerators, ice picks were a ubiquitous household tool used for separating and shaping the blocks of ice used in ice boxes. It is used for ice bricks breaking. It is made from very good quality material as it will never bend. The steel blade is 6" inches long. Ice Pick are manufactured from only high quality hardened & tempered, polished, high carbon steel. National Ice Pick service, quality and value make it one of the leading manufacturers of ice picks in India today. 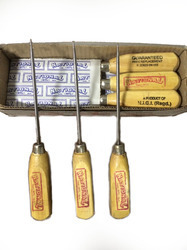 - Guaranteed lifetime durability Cheaper than usual wooden ice picks in the market Guaranteed more durable than wooden handle. Sturdy and Unbreakable metal pick. An Ice Poker or Ice Pick is very useful when breaking off large or small pieces of ice from an entire slab. You can buy Ice Pokers online from us, as we provide all standard sizes and types from renowned brands like Fine and many more.